Nihilumbra ($2.99 Universal, $8.99 Mac) is a story based puzzle game where you play the part of odd little creature that just wants to be free of The Void. The story starts out with the strange little oddity you play being born into a strange world. Being a creature of what is known as The Void, it was not thought possible to escape this alternate world. Be that as it may, escape came natural to you and into the real world the adventure begins. You soon learn that gaining your freedom and keeping it are two entirely different things. As soon as you escape into the real world, an army of various creatures from The Void are sent out to capture you and bring you back. Thus begins your life, constantly on the run from The Void. To start out, moving around is accomplished with a right and left controls and a button to jump with. You can also choose to use a tilt based control to move your way through each of the different worlds you encounter. 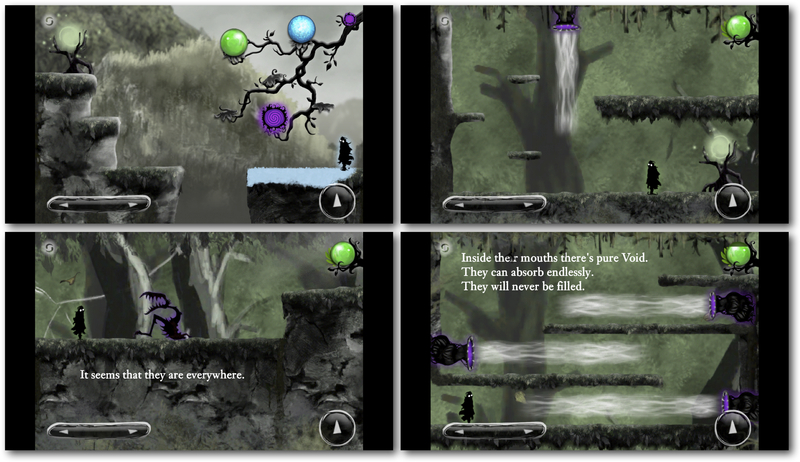 Along the way, you begin to face various obstacles that prevent you from escaping The Void. Sometimes you need to master jumping from one platform to another, while others you must find a way around the obstruction that blocks your way. When a new type of challenge is presented to you, the game will hint at a solution. Later on when that particular skill is need once again, the stakes are much higher and the challenge is more difficult. 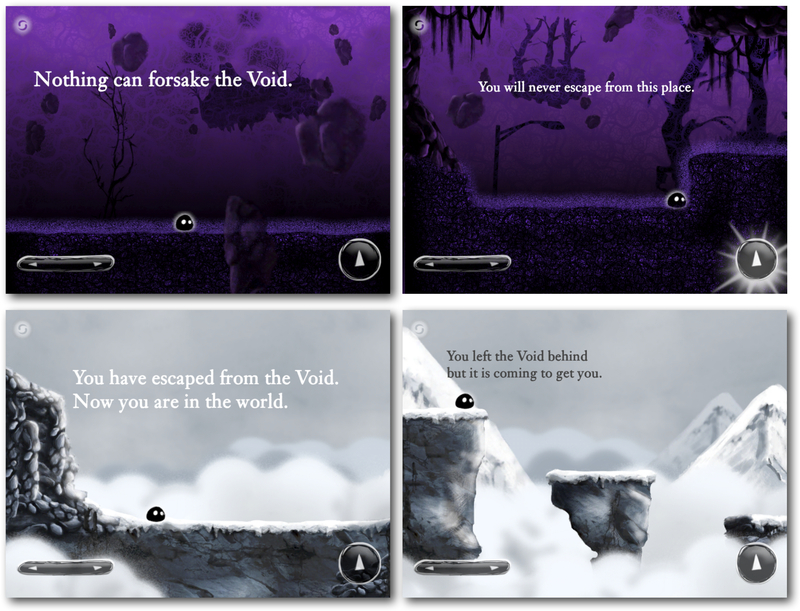 There are five different worlds that you escape into as you run from The Void. Each world has a different color to offer you. These colors become important as they unlock special abilities that you use to overcome the obstacles in the game. You use each color to paint the various surfaces in your surroundings. Once painted, the surface takes on a unique ability. Blue, which is acquired from a flower on the frozen mountain top, will turn the surface to ice. This makes you move faster and thus able to achieve longer jumps. 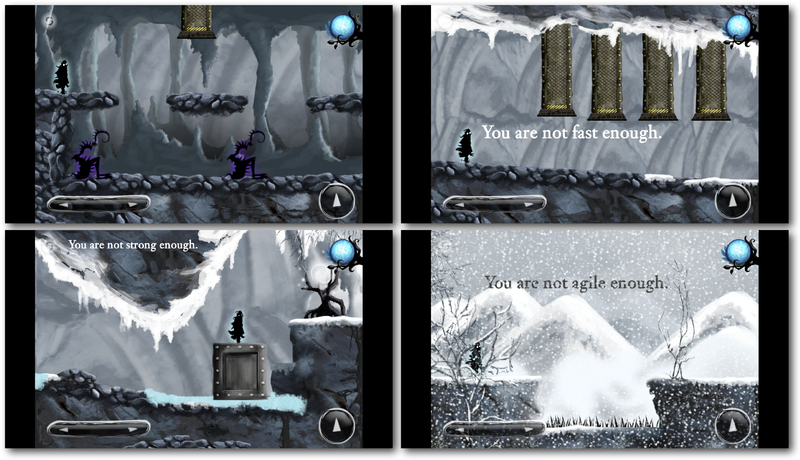 You can even use the edge of an icy cliff to send your enemies falling. The color you start out with, purple, allows you to erase any of the other colors you paint on each surface. This corrects a situations where you made a surface slippery when you really meant to make it sticky. With each new world you find another flower and a new color. Each color has its own ability. You never lose the colors you collect, and often times you will need to paint with more than one color to get through the obstacles that stand before you. The enemies that you face from The Void vary with each level as well. Some chase you while others will just block your way. Let them touch you and you will be sent back to The Void. There are various save points along the way in the form of lights you find in trees and bushes. Once you pass each light, you will start over again from that point. 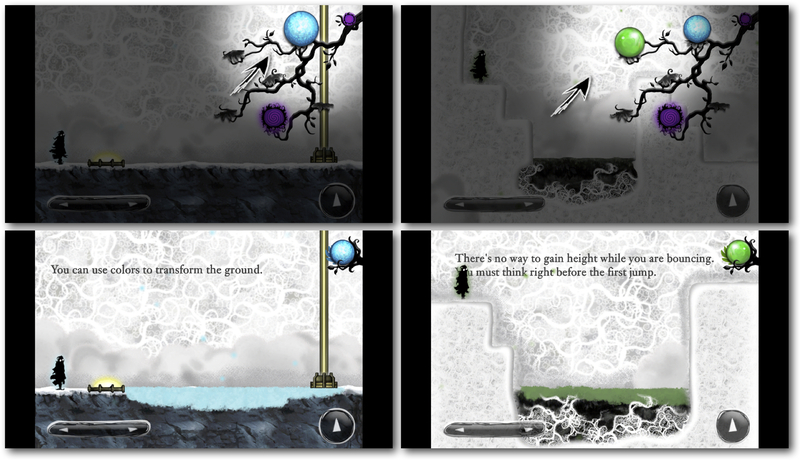 At the end of each level is a timed series of puzzles you must overtake. From the left side of the screen The Void comes tumbling after you. You can never get more than one screen ahead of it. This makes evaluating the upcoming obstacle somewhat challenging. You must make a split decision to jump up to a higher platform, or jump down to a lower platform to run away. What may not be obvious is which of the two directions is blocked on the next screen. Going back to choose the other route is not always an option, as The Void is constantly pushing its way towards you. The soundtrack is a perfect match for the overall eeriness of the game. There is an ongoing narrative in the form of textual messages that is The Void speaking to you, taunting you, trying to wear you down. The opposite of a self-help audio recording. If you feel that you have the self-esteem it takes to overcome such a constant antagonist, then use your free time and try to escape The Void this weekend.